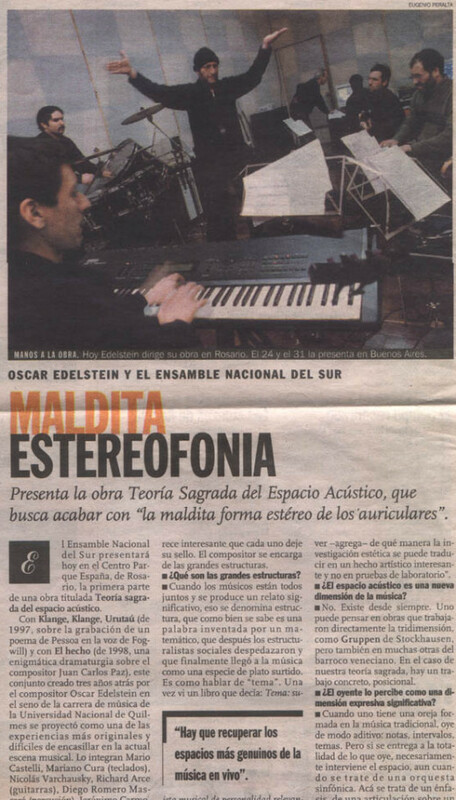 The Sacred Theory of the Acoustic Space - Book I is the first part of a trilogy composed, written, and directed by avant garde Argentinean composer Oscar Edelstein. This trilogy is made up by the Acoustic Grid - Book II and The Light in Shadows of Your Dead Eyes - Book III. 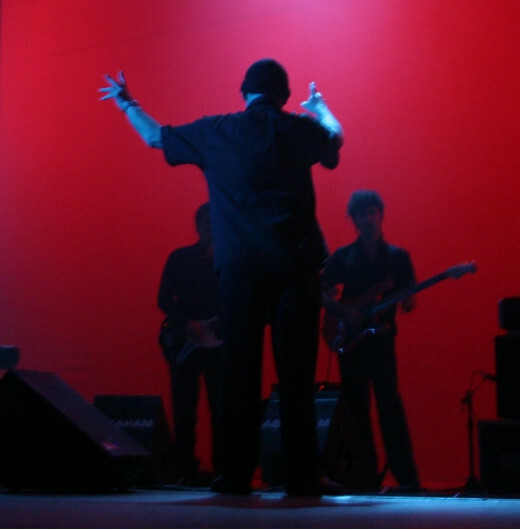 The successful series of concerts in 2000 and 2002 finally led to the recording of the work in 2004. 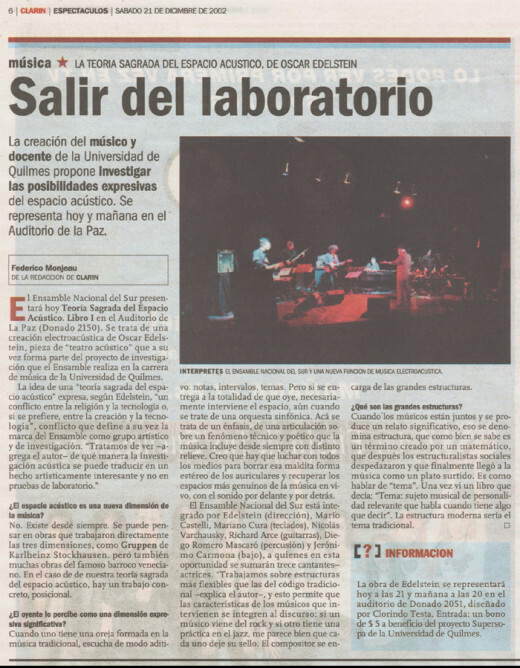 As Edelstein noted in the interview, "Salir del Laboratorio" (Escape from the Laboratory) with music critic Federico Monjeau, (Clarín), "The Sacred Theory of the Acoustic Space - Book I" in part refers to his preoccupation with the dimension of working with a sense of space - something that is not necessarily new in music or unique to contemporary composition, but as Edelstein highlights, is music that considers the 3 dimensional space whether that be German composer, Karlheinz Stockhausen's "Gruppen", or indeed the line that can be drawn back to the acoustic experimentations during Venetian Baroque such as the construction of cathedrals apt for choirs or whispered conversations. 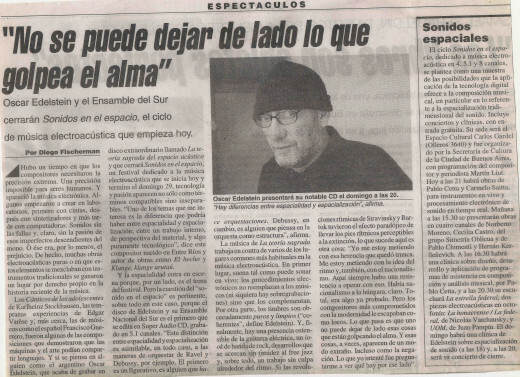 In "Volúmenes musicales" music critic Federico Monjeau (Clarín) identifies an important characteristic of Edelstein's work with the ENS, that of the use of rhythm and oscillating pulses. 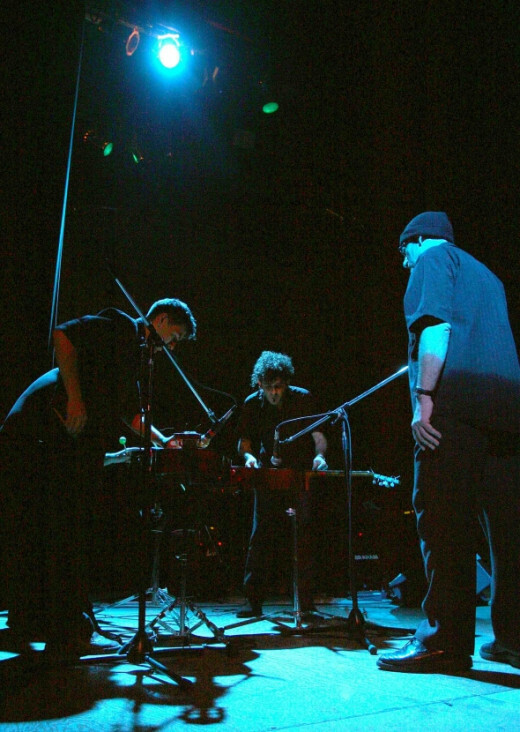 "Edelstein and his musicians have come to a very subtle understanding ...There are pulsing or percussive instruments, closer to free jazz or rock than the academic group or of the tradition electro-acoustic organ... 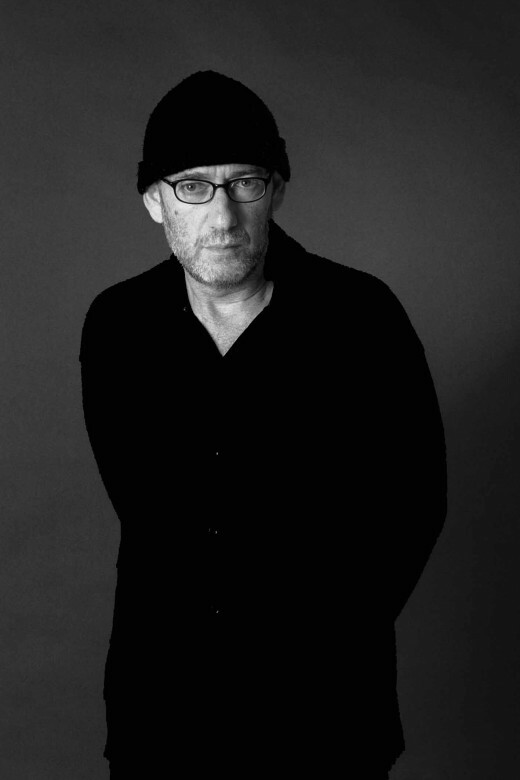 There is a curve in the instrumental action and also there is a narrative to the work, from the Prologue in which the materials seem to actually wake up until the twilight premiered his epilogue of Edelstein, a strangely impressionistic fragment casting a beautiful retrospective light. In the second movement, Engranaje (Gears), effectively puts the machinery in motion with a single note that rattles through different planes and instruments. The graduation is admirable. The rhythmic organisation ranges between a geometric form (a chromatic progression that empties out the pulse) and an additive form of pulse. The two forces are mutually invoked, rescuing a type of expression a little forgotten in contemporary music. 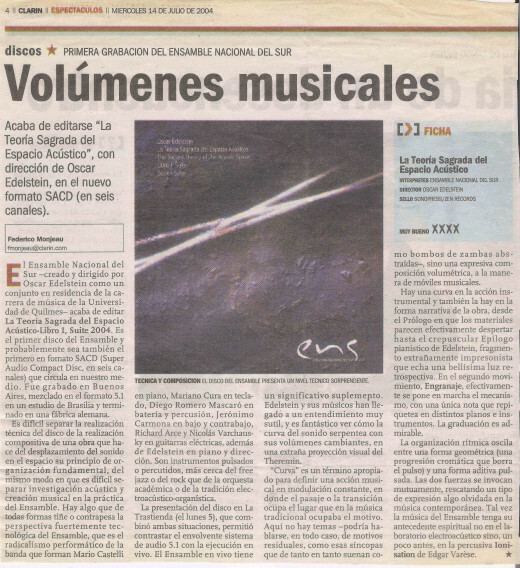 Maybe the music of the ENS has it’s spiritual precedent not in the electro-acoustic laboratory but a little before, in the percussive Ionisation of Edgar Varèse." From the disc notes: The complete work was recorded in real time according to the musicians stage performance, following the indications in the score, and without any processes of edition or assembling. The resulting spacial structures are the product of the development of timbrical, rhythms and/or dynamic curves produced by the performers, placed in fixed positions. The piece uses its own system of 3D notation, which includes a non-conventional musical conducting code. Edelstein sees the new format Super Audio Compact Disc (SACD) as the best combination between analog and digital recording as it improves the audio quality and allows the listener to hear the music in six channels. 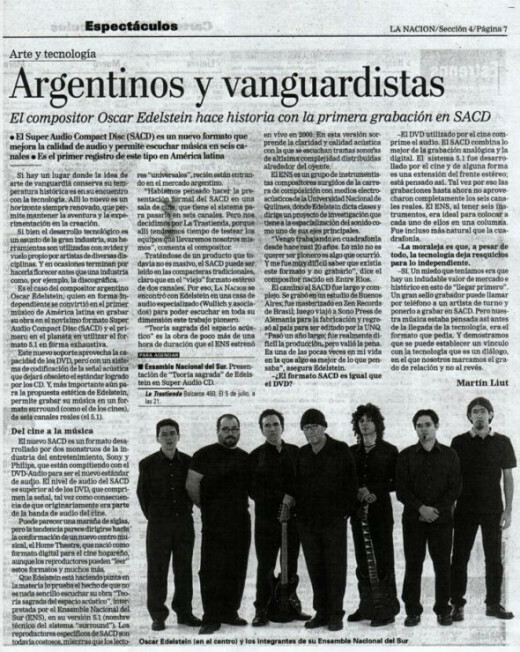 As he says in his interview with Martín Liut (music critic of the La Nación and now composer in his own right) in "Argentinos y vanguardistas"; SACD is "the format that the music called for and the recording took full advantage of the fact that there are six channels, and as the ENS have six instruments it was ideal to place each one in a column." 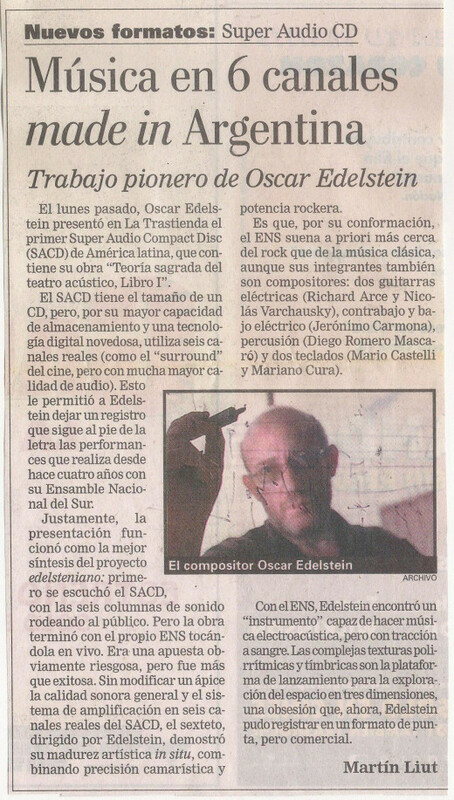 Edelstein sees the technology of SACD as a natural fit for his music and that it matches even better than the quadraphony that he so often uses live. For the second staging of the concert in Auditorio de la Paz (2002), in Buenos Aires, Edelstein added an eleven piece choir of female voices; Bibiana Aflalo, Alicia Burdeos, Verónica Díaz Benavente, Carolina Epíscopo; Inés Hillar, Mercedes Krapovickas, Valeria Martínez Eguizábal, Ariadna Moren, Magalí Sánchez Alleno, Titi Suárez and Dolores Kiala Ullman. 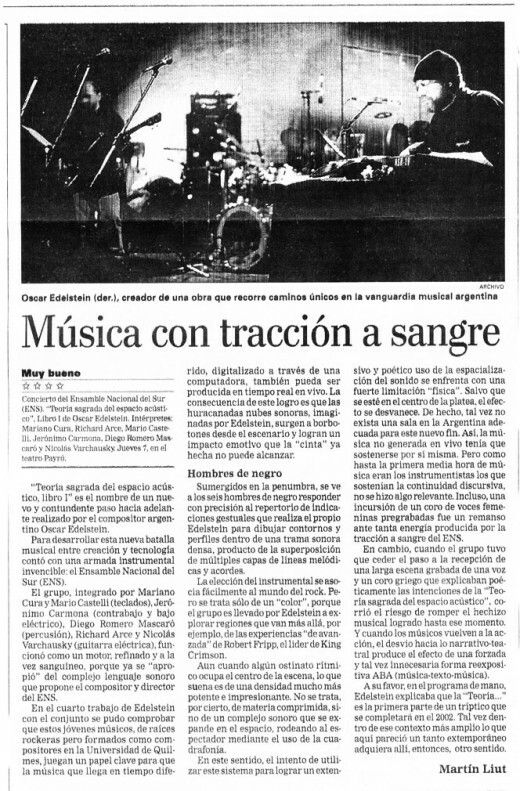 Choir: María Jesus Pavón, Ana Silvia Mendieta, Celicia Pastorino, Rosano Bravo, Vivíana Figueroa, Fabiana Mozotta, Graciela Spinelli, Barbara Torres, Bibiana Aflalo, Alicia Burdeos, Verónica Díaz Benavente, Carolina Epíscopo; Inés Hillar, Mercedes Krapovickas, Valeria Martínez Eguizábal, Ariadna Moren, Magalí Sánchez Alleno, Titi Suárez and Dolores Kiala Ullman.